Apache Mesos is a centralized, fault-tolerant cluster manager, designed for distributed computing environments. Mesos is an open source project and was developed at the University of California at Berkeley. It provides resource management and isolation,scheduling of CPU & memory across the cluster. Mesos joins multiple physical resources into a single virtual one. In some ways, it is the opposite of classic virtualisation, where a single physical resource is split into multiple virtual resources. With Apache Mesos you can build/schedule cluster frameworks such as Apache Spark. The clusters of commodity hardware, where you use a large number of already-available computing components for parallel computing are trendy nowadays. To handle such clusters you need a suitable framework. Although many cloud computing frameworks exist today, you have to choose the right one for you, since every framework has its pros and cons. In larger organizations, multiple cluster-frameworks are required. Split your cluster and run one framework per sub-cluster. Virtualize and allocate a set of VMs to each framework. Data Locality simply answers the question : How expensive is it to access the needed data? An example of such access cost could be the elapsed time. You have probably already heard about that concept, because it is also used by routers to choose the best route in a network. Compute frameworks often divide workloads into jobs and tasks. Tasks usually are executed fastly, often multiple jobs per node can be run. Jobs should be run where the data is, so you have a better ratio between time used for data transport vs. computation. Short job execution times enable higher cluster utilization. What we need is a unified, generic approach of sharing cluster resources such as CPU time and data across compute frameworks. This is what Mesos provides! Mesos has also a master daemon that manages slave daemons running on each cluster node. The master controls resources (cpu, ram, …) across applications by making resource offers to applications. They can either take them by specifying tasks that can run on those resources or reject them. The master decides about resource offering to frameworks based on organizational policy such as fair sharing or strict priorities. If the policies don’t fit, you can add new policy strategies via plug-ins. The scheduler registers with the master and receives resource offerings from the master. The Scheduler decides what to do with resources offered by the master within the framework. The Executor is launched on slave nodes and runs framework tasks. Slave 1 tells the master that it has 4 free CPUs and 4GB memory. The Mesos master invokes the allocation module which tells that framework 1 should be offered all available resources. The allocation module sends a resource offer to the framework describing what is available on slave 1 for it. The framework scheduler of framework 1 responds to the Mesos master and sends information about two tasks which should run on slave 1. 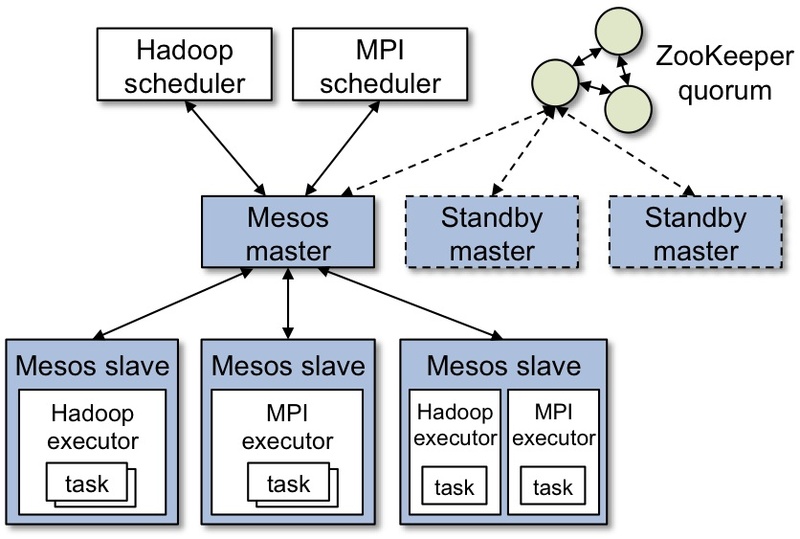 The Mesos master sends the two tasks to Slave 1, which allocates appropriate resources to the executor, which launches the two tasks. As you can see, the tasks need only 3 CPUs and 3GB of memory. The 4th CPU and the other 1GB of RAM are now offered to Framework 2. What do I need Mesos for? How to match resources to a task with Mesos? Where can I learn more about Mesos? It supports a much wider class of applications than MapReduce while maintaining its automatic fault-tolerance. E.g. machine learning algorithms and graph algorithms such as PageRank. User loads data into RAM across cluster and query it repeatedly. Maintain aggregate state over time. To support these applications efficiently, Spark offers an abstraction called Resilient Distributed Datasets (RDDs). RDDs can be stored in memory between queries without requiring replication. RDDs can rebuild lost data by lineage, therefore it remembers how it was built from other datasets. Spark runs as independent sets of processes on a cluster and is coordinated by the SparkContext in your main program (driver program). The SparkContext can connect to several types of cluster managers, which allocate resources across applications. The Cluster Manager can be a Spark standalone manager, Apache Mesos or Apache Hadoop YARN. Spark acquires executors on nodes in the cluster. The executor is a process, runs computations and stores data for your app. Then Spark sends your application code to the executors. Each application has its own executor, which lives as long as the app lives and runs tasks in multiple threads. This isolates one application from others. Each scheduler schedules its own tasks. When you have different apps, they have different executors and different JVMs. Show me a Spark Demo!